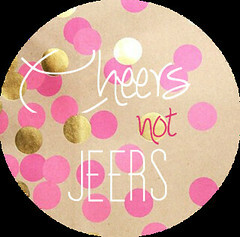 Decoybetty: Cheers not Jeers: Yellaphant! Today I'm joining up with Casey from The Aslan's Auspicious Albany Adventure again for her link up Cheers not Jeers which basically spreads some love to the blogosphere. Today, I'm throwing some cheers to Bridget from The Yellaphant. I have been reading Bridget's blog since 2008 which is basically forever. I adore her attitude of approaching life's obstacles with a sense of humour and large dash of wit. She recently had a pretty awful day (go to her blog...you'll see), and I think she deserves some cheers. She is also trying to run the Boston Marathon next year (did I mention she runs marathons? I admire her so much for her commitment to running - I simply do NOT understand it, but it makes her happy...so I'm so down with that) and she is struggling to get a team to let her in (a charity team). So if you could tweet at Mass General hospital and ask them to let her in (Click here to tweet). She was at the finish line when the bombs went off last year. She's basically a super hero. Go say hi, send her some love, and read her blog (from beginning to end) - you'll laugh, cry, and have a grand ole time that's a money back guarantee! You are amazing! Sending so much love from your beloved New England!